02 I’m Helena, and I’m a front-end developer at Lullabot! I specialize in making the web awesome for everybody. I’m Helena, and I’m a front-end developer at Lullabot! I specialize in making the web awesome for everybody. 03 Strategy // Design // Development We’re an interactive strategy, design, and development company. We create delightful experiences using Drupal and open source technologies. [Lullabot logo] [Photo of Lullabot employees enthusiastically jumping with their hands in the air on the beach] We’re an interactive design, strategy, and development company. We create delightful experiences using Drupal and open source technologies. 91 What is Web Accessibility? What is Web Accessibility? USERS WHO BENEFIT 56 Web Accessibility Helps Everyone Visually Impaired Visually impaired users may have trouble distinguishing between colors, viewing content without enough Deaf / Hard of Hearing Deaf and hard of hearing users may Visually Impaired Deaf / Hard of Hearing contrast, or may not be able to see at all. with dexterity or movement. This may make using the fine motor skills required Seizure Disorders Motor Impaired Everybody Else Seizure Disorders for using a mouse diﬃcult or impossible. Vestibular Issues Individuals with vestibular issues can feel sick from content with special effects that trigger motion sickness. content if there is not an appropriate alternative transcript or captioning. Motor Impaired Motor impaired users may have trouble have trouble understanding audio Users who are prone to seizures can be triggered into an attack by flashing effects. Cognitive Differences Vestibular Issues Users with cognitive differences might Cognitive Differences need more time to ingest material. Allowing users to explore content at their own pace is best. Users Who Benefit: Accessibility Helps Everyone [Graphic of a circle with the outer edge broken into six wedges, each with its own label: “Visually impaired, motor impaired, vestibular issues, Deaf / hard of hearing, seizure disorders, cognitive differences”. In the center, there’s a hot pink circle that says “Everyone else” to represent that accessibility benefits not just people with disabilities, but everyone else as well.] Visually Impaired Visually impaired users may have trouble distinguishing between colors, viewing content without enough contrast, or may not be able to see at all. Motor Impaired Motor impaired users may have trouble with dexterity or movement. This may make using the fine motor skills required for using a mouse difficult or impossible. Vestibular Issues Individuals with vestibular issues can feel sick from content with special effects that trigger motion sickness. I think we’ve all bought something online that we could have driven down to the store to get in a few minutes because we didn’t feel like going out. Because ew, who wants to spend twenty minutes going to the store if you can buy it online and have it delivered right to your door?? If you’re anything like me, this picture of someone typing a credit card into a computer sums up a good portion of your purchases. Except, you know… you memorized those numbers long ago. Ahem. Anyway. POUR 50 Understanding the Needs of Users Perceivable Users should be able to perceive your content, despite possibly needing to access the information in an alternative way. " [Outline of a head opened like a box with a mix of many different icons arranged as a heart-shaped thought cloud. Some of the icons include an eye, a set of gears, an arrow pointing down into the head, and a rocketship. This image maintains on the next few slides.] Perceivable [In the thought-cloud, one of the icons is an eye, and that one is pink. The rest of the icons are gray.] Users should be able to perceive your content, despite possibly needing to access the information in an alternative way. Operable [In the thought-cloud, the pink eye is now gray with the others. The gears are now pink instead.] Users should be able to perceive your content, despite possibly needing to access the information in an alternative way. POUR 50 Understanding the Needs of Users "
91 How Do People with Disabilities Use the Internet? Access Techniques - just a little bit of background Many people with disabilities use assistive technology to use the internet. Assistive technology comes in many forms, depending on the disability. Try it yourself! 12 Mac VoiceOver ! You have a free screen reader on your computer! ! On a Mac, just press command+F5 to bring up VoiceOver ! Use tab and enter to navigate a site You can try this yourself at home using ‘tab’ to page through the page, and ‘enter’ to click. If you’ve got a Mac, try it with command+F5; there’s a free screen reader in there so you can hear what your blind user will hear. This isn’t a totally accurate depiction, since most blind users are more proficient than you and might use different software, but it’s a good starting place with a low learning curve for thinking about a visionless web. Try it yourself! 12 Window-Eyes ! If you have Windows 10 or later, Window-Eyes is available to you free of charge. ! Steadily gaining on JAWS for the biggest piece of the market share amongst fully-blind users Window-Eyes is free for Windows 10+ users, and it’s steadily gaining on JAWS for the biggest piece of the market share amongst fully-blind users. It’s hard enough when someone has come from a sighted world where they’re used to easily getting what they wanted. Casey Mathews http://www.lighthousecentralflorida.org/ It’s hard enough when someone has come from a sighted world where they’re used to easily getting what they wanted. When a site isn’t accessible it’s really a frustrating experience. People end up throwing up their hands and saying, “I’ll just get someone else to do it for me”. It’s sad to see that happen. Casey Mathews http://www.lighthousecentralflorida.org/ When a site isn’t accessible it’s really a frustrating experience. People end up throwing up their hands and saying, “I’ll just get someone else to do it for me”. It’s sad to see that happen. I know a lot of times I still see a lot of this where you’ll go through a form and stuff won’t be edited and labels won’t be labeled correctly. That’s probably the biggest thing that I see. It’s not as easy as tab, first name. Instead you get tab, edit. What does that mean?? Casey Mathews http://www.lighthousecentralflorida.org/ I know a lot of times I still see a lot of this where you’ll go through a form and stuff won’t be edited and labels won’t be labeled correctly. That’s probably the biggest thing that I see. It’s not as easy as tab, first name. Instead you get tab, edit. What does that mean? Sometimes you’ll be filling out a form and you’ll get to address, street name, and then you tab and you hear just edit. You can figure out that they want the second part of the address, but I see a lot of people get confused by that. I’ve seen very few forms where that’s actually done well. Casey Mathews http://www.lighthousecentralflorida.org/ Sometimes you’ll be filling out a form and you’ll get to address, street name, and then you tab and you hear just edit. You can figure out that they want the second part of the address, but I see a lot of people get confused by that. I’ve seen very few forms where that’s actually done well. Another thing that really gets people is phone number boxes. Some sites want the area code, some want it all split together, some want it all in different boxes, and it’s really confusing for people. Sometimes you’ll get there and you’ll be typing away and you don’t realize this box only wants three digits instead of ten. That’s confusing, and I see that a lot. Same thing with social security boxes. Casey Mathews http://www.lighthousecentralflorida.org/ Another thing that really gets people is phone number boxes. Some sites want the area code, some want it all split together, some want it all in different boxes, and it’s really confusing for people. Sometimes you’ll get there and you’ll be typing away and you don’t realize this box only wants three digits instead of ten. That’s confusing, and I see that a lot. Same thing with social security boxes. If you don’t have someone to read it for you, or if there’s an audio option but you can’t figure out how to get to the button for it, or you get into it but can’t figure out how to get out, it’s very frustrating. Casey Mathews http://www.lighthousecentralflorida.org/ If you don’t have someone to read it for you, or if there’s an audio option but you can’t figure out how to get to the button for it, or you get into it but can’t figure out how to get out, it’s very frustrating. People try to use the audio and the audio isn’t clear, so I’ve seen trouble with that, too. Casey Mathews http://www.lighthousecentralflorida.org/ People try to use the audio and the audio isn’t clear, so I’ve seen trouble with that, too. But I’ve seen forms that handle it really well, so it is doable. Google has this new thing where you just check a box. That’s great! Casey Mathews http://www.lighthousecentralflorida.org/ But I’ve seen forms that handle it really well, so it is doable. Google has this new thing where you just check a box. That’s great! People who are new to using a screen reader can get so frustrated after going through so much work to fill out a form and then not being able to submit it that they won’t even want to use technology anymore. Casey Mathews http://www.lighthousecentralflorida.org/ People who are new to using a screen reader can get so frustrated after going through so much work to fill out a form and then not being able to submit it that they won’t even want to use technology anymore. They decide it’s more trouble than it’s worth after having frustrating experience after frustrating experience and they totally give up on the computer. It makes me sad to see that. They decide it’s more trouble than it’s worth after having frustrating experience after frustrating experience and they totally give up on the computer. It makes me sad to see that. Casey Mathews http://www.lighthousecentralflorida.org/ They decide it’s more trouble than it’s worth after having frustrating experience after frustrating experience and they totally give up on the computer. It makes me sad to see that. Facebook has actually started doing auto-captioning of graphics. When somebody posts an image, they try to provide instantaneous alt-text to an image. It’s pretty crude text that it comes back with like, “two people in a park”, so it’s not a lot of description - but it’s better than nothing! A blind person, instead of just ignoring someone’s graphic post, they can at least have some idea of what it is. They can engage in that dialogue a little bit more. Casey Mathews http://www.lighthousecentralflorida.org/ Facebook has actually started doing auto-captioning of graphics. When somebody posts an image, they try to provide instantaneous alt-text to an image. It’s pretty crude text that it comes back with like, “two people in a park”, so it’s not a lot of description - but it’s better than nothing! A blind person, instead of just ignoring someone’s graphic post, they can at least have some idea of what it is. They can engage in that dialogue a little bit more. Twitter recently right after that included spacing for people to include their own alt-text for graphics. They don’t have to, but they can include alt-text. I wish they would have made it a requirement, but little things like that that crop up show that people are paying attention to accessibility. These things do make a big difference for people. Casey Mathews http://www.lighthousecentralflorida.org/ Twitter recently right after that included spacing for people to include their own alt-text for graphics. They don’t have to, but they can include alt-text. I wish they would have made it a requirement, but little things like that that crop up show that people are paying attention to accessibility. These things do make a big difference for people. Two zebras stand side by side looking at the camera in the savannah’s dry grass. The background is dotted with trees. “Two zebras stand side by side looking at the camera in the savannah’s dry grass. The background is dotted with trees.” Here’s what our image might look like with some nice alt text on there. Wow, we really have a better idea of the story now, right? Low-priced Africa nature excursions cheap discount coupon zebras lions rhinos safe Low-priced Africa nature excursions cheap discount coupon zebras lions rhinos safe If keyword stuffing gets abused, your zebras might look like this. Please don’t do that, even if your SEO guy says it’s a REALLY good idea. This is a big, big deal! Of course a blind person can’t just grab the menu and find out what’s on the menu. A lot of the time we’ll get the menu from the website. Casey Mathews http://www.lighthousecentralflorida.org/ This is a big, big deal! Of course a blind person can’t just grab the menu and find out what’s on the menu. A lot of the time we’ll get the menu from the website. Some restaurants won’t update the menu for three or four years, or they’ll update the menu by just putting a graphic or PDF up there. When you do that, you’re leaving some people out. I wish all menus had nice headings and were HTML-based. It would be a dream come true. Casey Mathews http://www.lighthousecentralflorida.org/ Some restaurants won’t update the menu for three or four years, or they’ll update the menu by just putting a graphic or PDF up there. When you do that, you’re leaving some people out. I wish all menus had nice headings and were HTML-based. It would be a dream come true. 12 In Their Own Words Meet Mike User Spotlight: Mike Fox Mike is a software developer who is visually impaired. Mike recently presented at this year’s Assistive Technology Industry Association (ATIA) conference on his innovations to streamline digital workflows for Lighthouse call center agents who are visually impaired. User Spotlight: Mike Fox Mike is a software developer who is visually impaired. Mike recently presented at this year’s Assistive Technology Industry Association (ATIA) conference on his innovations to streamline digital workflows for Lighthouse call center agents who are visually impaired. For me personally, I’d say the biggest challenge all comes down to keyboard navigation, because like I said, I use the keyboard for everything. So problems with things like tab order, keyboard shortcuts, focus etc. are a bit of a pain. Nothing I can’t handle, but I just wish they were done better than most sites do them. Mike Fox http://www.lighthousecentralflorida.org/ For me personally, I’d say the biggest challenge all comes down to keyboard navigation, because like I said, I use the keyboard for everything. So problems with things like tab order, keyboard shortcuts, focus etc. are a bit of a pain. Nothing I can’t handle, but I just wish they were done better than most sites do them. What would you say to a room full of Web Developers? What would you say to a room full of Web Developers? If you choose to use a content management system (CMS), I recommend Drupal. It’s accessible out of the box, right down to the administrative UI. Mike Fox http://www.lighthousecentralflorida.org/ If you choose to use a content management system (CMS), I recommend Drupal. It’s accessible out of the box, right down to the administrative UI. In Their Own Words 12 Meet Adriana User Spotlight: Adriana Mallozzi Adriana is a 36-year-old with quadriplegia cerebral palsy who has been living independently in Boston, MA for over 18 years. She serves on the Board of Directors of Commonwealth Community Care (formerly BCMG), as well as on the Regional Board for Easter Seals Massachusetts. User Spotlight: Adriana Mallozzi Adriana is a 36-year-old with quadriplegia cerebral palsy who has been living independently in Boston, MA for over 18 years. She serves on the Board of Directors of Commonwealth Community Care (formerly BCMG), as well as on the Regional Board for Easter Seals Massachusetts. Using a keyboard with a mouth stick or head pointer is the lowest tech way of accessing a computer and more prevalent than the more sophisticated and expensive options. For this reason, it is imperative that websites can easily be navigated with just a keyboard - i.e., the ability to tab between links, menu options, etc. Adriana Mallozzi http://handicapthis.com/team/adriana-mallozzi/ Using a keyboard with a mouth stick or head pointer is the lowest tech way of accessing a computer and more prevalent than the more sophisticated and expensive options. For this reason, it is imperative that websites can easily be navigated with just a keyboard - i.e., the ability to tab between links, menu options, etc. Assistive technology used by those with mobility impairments for accessing computers is basically a replacement of the conventional methods - being the keyboard and mouse/trackpad/trackball. So in theory, if a site is completely "browsable" by just using the keys on a keyboard (in conjunction with the accessibility features of the operating system - mouse keys and sticky keys), then it's accessible using any AT. Adriana Mallozzi http://handicapthis.com/team/adriana-mallozzi/ Assistive technology used by those with mobility impairments for accessing computers is basically a replacement of the conventional methods - being the keyboard and mouse/trackpad/trackball. So in theory, if a site is completely "browsable" by just using the keys on a keyboard (in conjunction with the accessibility features of the operating system - mouse keys and sticky keys), then it's accessible using any AT. In Their Own Words 12 Meet Michelle User Spotlight: Michelle Hedley Michelle is from the North East of England. She’s been severely deaf since birth and has seen how technology has changed and enhanced her life by way of access. She’s also seen that access be prevented when digital media is used without subtitles. She is passionate about provision of subtitles for the 11 million British people with some form of a hearing loss, and of course more around the world! User Spotlight: Michelle Hedley Michelle is from the North East of England. She’s been severely deaf since birth and has seen how technology has changed and enhanced her life by way of access. She’s also seen that access be prevented when digital media is used without subtitles. She is passionate about provision of subtitles for the 11 million British people with some form of a hearing loss, and of course more around the world! Any website that uses visual presentation to get their point across or to demonstrate facts needs subtitles; the BBC are a prime example. They use videos instead of text to present various news. Without subtitles I cannot access that piece of news at all. Michelle Hedley Any website that uses visual presentation to get their point across or to demonstrate facts needs subtitles; the BBC are a prime example. They use videos instead of text to present various news. Without subtitles I cannot access that piece of news at all. It used to be just one or two items, now they continually use this method to get their facts across. Michelle Hedley It used to be just one or two items, now they continually use this method to get their facts across. One thing I'm really passionate about is captioning or subtitles! When there aren't subtitles on videos especially on websites, I can't follow them because I'm a lip reader and can't hear what they're talking about. Ellie Parfitt dayinthelifeofadeafie.wordpress.com/ One thing I'm really passionate about is captioning or subtitles! When there aren't subtitles on videos especially on websites, I can't follow them because I'm a lip reader and can't hear what they're talking about. Remember - live streaming captions do not work and they are not accurate (like youtube's automatic captions). If subtitles aren’t an option, provide a written transcript. Perhaps consider sign language videos too. Ellie Parfitt dayinthelifeofadeafie.wordpress.com/ Remember - live streaming captions do not work and they are not accurate (like youtube's automatic captions). If subtitles aren’t an option, provide a written transcript. Perhaps consider sign language videos too. The other thing that I would want from websites, and this is dependent on the service being provided, is a chat online facility in place of or as well as a phone help line. This has proved invaluable to me from companies where I can resolve issues independently without relying on a third party to make a phone call. Michelle Hedley The other thing that I would want from websites, and this is dependent on the service being provided, is a chat online facility in place of or as well as a phone help line. This has proved invaluable to me from companies where I can resolve issues independently without relying on a third party to make a phone call. It really bugs me when sites don't provide email addresses! Not all deaf people can use the phone and email or text is often the best communication method for us. It's always a struggle trying to get in contact with some companies - I end up having to use Twitter to ask for an email! Ellie Parfitt dayinthelifeofadeafie.wordpress.com/ It really bugs me when sites don't provide email addresses! Not all deaf people can use the phone and email or text is often the best communication method for us. It's always a struggle trying to get in contact with some companies - I end up having to use Twitter to ask for an email! 91 It’s About Craftsmanship. As web developers, we’re craftsman. Craftsmen take pride in their work. We don’t hang our hats on sewing sloppy stitches - our goal is to build something beautiful and functional and elegant, and if we have millions of people who cannot use what we have built, it doesn’t matter how great everything else about it is. 91 It’s About Craftsmanship. It’s About Craftsmanship. Take the ten seconds to put that accessible text in. Not because you have to. Not for the sake of ADA compliance or to fulfill a requirement on a ticket. Do it because you give a damn about the other human being on the receiving end of your work who will otherwise have to spend their afternoon going to the store to purchase something they could have bought online in ten seconds if you would have typed in forty-five more characters to build the button right. Put the captions on your videos; not because the ADA says you should, but because Frank should get to watch Game of Thrones at the same time as all of his friends without having it spoiled for him by the time the captions come out. Let your work shine. Take pride in it. Be hungry to learn, hungry to perfect your craft, hungry to include more people in whatever you’re building today. 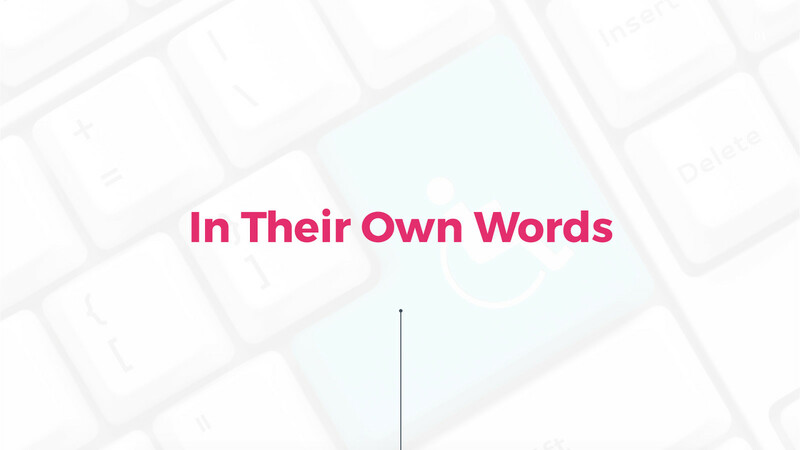 View In Their Own Words - Keynote on Notist. Helena shares the real stories of people with disabilities to explain the principles of web accessibility and to inspire us to build a more inclusive web. Sending a warm welcome to all #TCDrupal attendees! Happy to be a sponsor this year, and excited for @misshelenasue's #accessibility keynote!